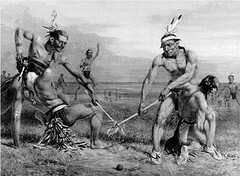 Lacrosse has its origins in a tribal game played by all eastern Woodlands Native Americans and by some Plains Indians tribes in what is now Canada. The game has been modernized extensively by European immigrants to create its current form. Lacrosse is steeped in tradition, and though today’s participants use sticks of plastic and titanium rather than wood, the lacrosse stick symbolizes the historical significance of the game. Today’s players continue a long tradition of “Honoring the Game“. The sport of lacrosse is a combination of basketball, soccer and hockey. Anyone can play lacrosse — the big or the small. The game requires and rewards coordination and agility, not brawn. Quickness and speed are two highly prized qualities in lacrosse. It has been called the fastest game on two feet and is a grueling test of stamina. Ironically, lacrosse also served as a preparation for war. Legend tells of as many as 1,000 players per side, from the same or different tribes, who took turns engaging in a violent contest. The games were played in open plains located between two villages, and the goals could range from 500 yards (460 m) to several miles apart. Rules for these games were decided on the day before. Generally there was no out-of-bounds, and the ball could not be touched with the hands. Playing time was often from sun up until sun down and sometimes for days. Some tribes used a single pole, tree or rock for a goal, while other tribes had two goalposts through which the ball had to pass. Balls were made out of wood, deerskin, baked clay or stone. Lacrosse became an Olympic sport for the 1904 and 1908 Summer Olympics, but was then dropped as an official sport. After 1908, lacrosse was a sport in the World Games. Men’s and women’s lacrosse were played under virtually the same rules, with no protective equipment, until the mid-1930s. At that time, men’s lacrosse began evolving dramatically, while women’s lacrosse continued to remain true to the game’s original rules. In the 1930s, an indoor version of the game, box lacrosse, was introduced in Canada. It quickly became the dominant form of the sport in Canada, in part due to the severe winter weather that limited outdoor play.